The onboard 4MHz RC oscillator makes the instructions execute at one million per second. This is helpful when producing delay values. When using the PIC16F628, the 4MHz RC oscillator inside the chip, is used. When an input is not connected, it is called "left open" or "floating." To make sure the micro detects a LOW, an input must be taken to the 0v rail (commonly called "ground"). To make sure the micro detects a HIGH the input must be taken to the +5v rail. (It can be taken to a voltage higher than 5v, providing a current-limiting resistor with a resistance of at least 1k for every volt on the supply rail.) A floating input may detect a HIGH or LOW. Any voltage above 2.4v will be detected as a HIGH and any voltage below 0v8 will be detected as a LOW. This means you should deliver a voltage as close to 5v as possible to produce a HIGH and as close to 0v as possible to produce a LOW. Unused inputs do not have to be connected to any level. If they are not connected, do not expect to get a known reading. To make RA0 LOW, connect it to 0v via a jumper or switch. To make RA0 HIGH, connect it to +5v as shown in the diagram above. A LOW can be created by placing a transistor on any of the input lines as shown in the diagram below. When the transistor is "turned-on," (commonly called "bottoming" or "saturation") the voltage between the collector and emitter is approx 0.35v to 0.5v and this is seen by the micro as a LOW. The buffer resistor on the base of the transistor allows any voltage to be applied to the transistor without damaging it. When the transistor is not turned on (called "cut-off") the input of the microcontroller sees a HIGH via the 10k "pull-up" resistor. The transistor-stage is an inverter. A HIGH on the input (via the 22k resistor) is seen by the micro as a LOW. Reset is available as a pin on the edge of the board. Normally you would not need this pin but when developing a program, it is handy to reset the chip. This pin is taken to 0v via a switch to reset the chip. It is only a momentary action. Remove the link to start the program at address location 000. The transistors in our project do not "supply" current to the output device but connect the device to the 0v rail. The supply rail delivers the current and voltage. Two of the transistors are fed via 220R base resistors, and six have 470R base resistors. If the gain of the transistor is 100, all transistors will deliver one amp to the load. But if the gain is about 50, the six transistors with 470R base resistors will deliver 10 x 50 = 500mA, while the two with 220R will deliver the full 1-amp. Another module in the series is PIC Robot-1. It has two "H-bridges" to drive two motors in either forward or reverse direction. The transistors in the bridge are rated at 2 amp to allow for the heavy starting current of a motor. The module has an on-board regulator. This is a 78L05 - a positive 5v regulator capable of delivering 100mA. 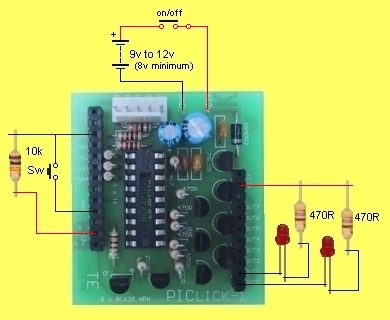 This allows the module to be supplied from 8v to 12v. The regulator ONLY supplies the chip. All the current for the output devices is obtained from the main supply rail. This supply can be any voltage from 3v to 12v (or more). The regulator requires a minimum of 8v so that it will produce a 5v output. If you want to supply the module from a 6v battery, the regulator can be removed and a jumper placed between the in and out terminals. The power diode must be included to drop the 6v to 5v5. The input lines can be used as outputs. There is no problem with this. Just make sure no switches are connected to the line if you are going to remove the 1k buffer resistors. The only feature you have to remember is RA4. It can only output a LOW. It cannot output a HIGH. The following circuit shows how it works. RA0, RA1, RA2, and RA3 can be converted to outputs and the load current can be up to 250mA. RA4 requires a pull-up resistor and in our case the lowest value is about 22k. Any value lower than this will create a voltage divider on the base to keep the transistor ON when the output of the micro is low. The base resistors can be reduced to 220R, if needed, for all outputs. A 220R on RA4 will allow the base-bias resistor to be 4k7 and the load current can be 100mA. Generally, very few input lines are needed in a project and PortA has 5 inputs. This should be enough to cover all requirements. It is not convenient to convert one of the output lines on PortB to an input. The uses for PIC LICK-1 are up to you. It has driving capabilities up to 1 amp per output and all outputs can be activated at the same time, providing the power supply will deliver the current. The supply voltage to the load is totally independent of the PIC LICK-1 module. The module actually operates from an on-board 5v regulator. If you supply the module from a 12v source, this 12v will be available for each of the outputs. Ideal projects for this module include a set of high-bright running LEDs, as stop-lights for a car. Many projects presented on the web and in magazines, covering projects such as this, drive the LEDs from the outputs of the chip. This is quite unsatisfactory if you want to produce a really good effect. The answer is to drive them from a buffer transistor and deliver the maximum current. This can be 25-40mA for a normal LED and up to 100-250mA for special high-bright LEDs. Currents up to 4 times these values can be delivered for very short periods of time and this is why you need high-current drivers. There is actually two ways to illuminate a LED. The simplest is to deliver a constant current of approx 25mA and the other is to deliver 40mA for a duty cycle of 25%. Both methods will produce the same output brightness. This is one of the amazing features of a LED. It can be pulsed with a very high current for a short period of time and the output brightness will be the same as a lower constant current. But when you work out the difference in consumption, the pulsed-mode consumes less energy. In the case above it is 25:10. The outputs of a PIC chip are limited to 25mA and this prevents the pulsed-mode being employed. However, with the PIC LICK-1 you can deliver a higher current and new capabilities open up. Apart from delivering a higher current, the two ports can be combined to produce a run of 12. This allows one input line for the start/stop button or an input from a sensor in the car. If you want a longer "run," you can multiplex two runs to get 20 outputs. "I have a problem. I desperately need a relay or circuit that will take a set voltage & send it to one device and send an ever-escalating variable to another device." This is a request from Jeremy A. from the Resource section of Poptronics. This is just an example of the type of request that comes to a design engineer. In this case, no further information was provided and the requirement is too vague to start designing a prototype. But when you get this type of requirement from the "factory floor" you have to think very carefully before starting a design. Most of the time the initial outline includes only part of the request. After a few discussions the requirements include delays, signals, counting and lots more. Quite often it is best to design around a microcontroller. It allows easy additions and modifications, especially when the requirements are not fully known or understood. Consider this project as a high-drive-current PIC16F84A or PIC16F628. You can now design projects that require up to 1amp per output. This is especially suited for model train projects; to drive relays, motors, actuators or sequencers. It can also be used in automobile applications and displays. A request from a model train shop came in last week. They wanted a sensor on the window to detect when a person was viewing the display. This consisted of a photo darling photo-transistor and amplifier that detected a rapid change in the level of illumination. The track was activated and a train was required to travel down the track and reverse. The activation was required for 3 minutes. Photo transistors on each end of the track detected the loco and activated a reversing relay. Everything was done in the PIC LICK-1 module and it only required three photo darlington transistors and two relays to produce the effect. Variety was added by allowing the loco to travel partially down the track before reversing. The photo detectors at each end prevented to train hitting the buffers. There are two ways to start writing a program. One is to start from scratch and the other is to pull-apart a working program. The easiest way is to use a previous program as a template. It will save a lot of thinking a provide all the set-up instructions. Strip it down to the minimum number of instructions and make sure you don't have any duplicate labels. To work out how to create a set of instructions to get the micro to carry out a particular operation, refer to our Library of Routines and "Copy and Paste" file. You can also get many ideas from the projects we have developed. To program a chip, the simplest way is to remove it from the board while it is fitted to an extra socket. This makes removal very easy. All you do is push the chip sideways and it will lift off the board. Take it to the Multi Chip Programmer and use IC-Prog v5 to program the chip. Make sure the processor is PIC16F628 and the oscillator is IntRC I/O. The fuse settings are discussed below. All the instructions for the routines in a program, (approx 33) for the PIC16F628 are exactly the same as the PIC16F84A. When using a PIC16F628, it is important to set up the chip so that the internal oscillator is activated (default oscillator is 4MHz), and the comparators are disabled. This is done via the instructions in SetUp. The configuration settings are shown in theTextPad file below. Configuration settings are also on IC-Prog programming screen when programming a PIC chip. Select PIC16F628 as the processor and IntRC I/O as the oscillator. Tick PWRT - a short internal delay in the chip will be activated so that the power rails have time to settle down before the program is started. Tick BODEN - the chip will reset if the rail voltage goes below 2.5v and returns to 5v. Untick LVP - this is for low-voltage in-circuit programming, but you lose in/out pin RB4! copy the instructions. You can still "burn" the chip 1,000 times with Code Protect activated as the chip will be erased when Code Protect is active. When a chip is "burnt," the all the cells (memory locations) are firstly erased, then re-programmed. END ;This is the start of memory for the program. ;Go to Bank 0 - the program memory area. When using a PIC16F628, the files for your program start at 20h and end at 70h. This provides 96 files and any of them can be used as temporary storage and in your routines. There is a further 128 files if you need them. There is also a 128 byte EEPROM where you can store information that will not be lost when power is removed from the chip. The EEPROM is not generally used for short-term storage during the running of a program as it takes a long time (in computer terms) to store a value in the EEPROM. The EEPROM can only be written about 1,000,000 time and this can easily be exceeded when a program is constantly executing. Moving a program from a PIC16F84 to a PIC16F628 or vice versa is very simple. In a PIC16C84 and PIC16F84, files 00 to 0D are used by the micro, so that the programmer can use files 0C to 2F or 4F for a PIC16F84A. In a PIC16F628, files 00 to 1F are used by the micro, so that the programmer can use files 20h to 7F. To move a program from a PIC16C84 or PIC16F84A to a PIC16F628, simply add 20h to each file. In other words, file 0C becomes 2C and file 1A becomes 3A, file 28h becomes 48h etc. You MUST increment ALL files so that you don't get two files such as 2C. All the instructions and routines in a program for a PIC508A, PIC16C84 and PIC16F84 can be burnt into a PIC16F628, providing the file numbers are increased as described above and providing you use instructions in a '508A that are also suitable for the other processors. It is very rare that a program is migrated from a PIC16F628 to a PIC16F84A. If the files are located between 20h and 4F, no changes are needed. The instructions in SetUp, to disable the comparators, are not needed for a PIC16F84A. We will now cover a simple program to test the PIC LICK-1 module. The diagram below shows how to wire a switch and two LEDs to the PIC LICK-1 to test the input and output ports. The program outputs to all the 8 lines of Port B as a "LED Chaser." Up to 8 LEDs can be placed on this port to see the complete effect. A switch is placed on RA0. When it is pressed, the LEDs "Freeze." The supply voltage can be 8v to 24v. The voltage to the microprocessor is fixed at 5v by the 78L05 voltage regulator. This is 100mA device. When an output is active, the chip takes an extra 10mA. When all outputs are active, the current taken by the micro is 100mA. The voltage regulator will dissipate 500mW. This means the voltage across it can be 5v, when maximum current is flowing. When the supply voltage is above 12v, the voltage regulator will need to be heat-finned or only some of the outputs can be active. ;Clear the carry bit so that only one LED is lit. ;Has bit reached end of file? The program turns on the lowest bit of Port B and CALLs a delay to illuminate a LED. The bit is then moved across the "register" or "file" or "port" to the next output. The program creates a loop that shifts and displays the LEDs (one at a time) and looks to see if the highest bit is "set." If it is set, the program starts again. PIC LICK-1 is the first module in our range. 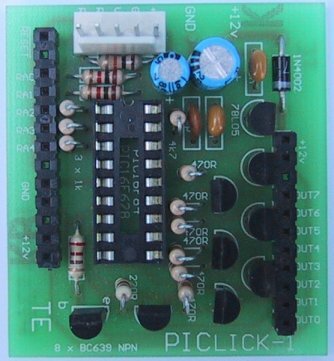 The next module, PIC LICK-2, uses surface-mount transistors and a standard 18-pin PIC16F628. This chip has three more in/out lines than the PIC16F84A but not all lines of PortA are both input and output and you must set up the chip at the beginning of your program so that all the in/out lines of PortB are available. The module does not use all the lines but basically it is a "full port" plus 5 input lines. This should be sufficient for most applications.